Justin Timberlake And Jay-Z Confirm 'Legends Of The Summer' 2013 Stadium Tour? The 'SexyBack' singer and the rapper will apparently head out on a 12-date jaunt across a series of US cities. 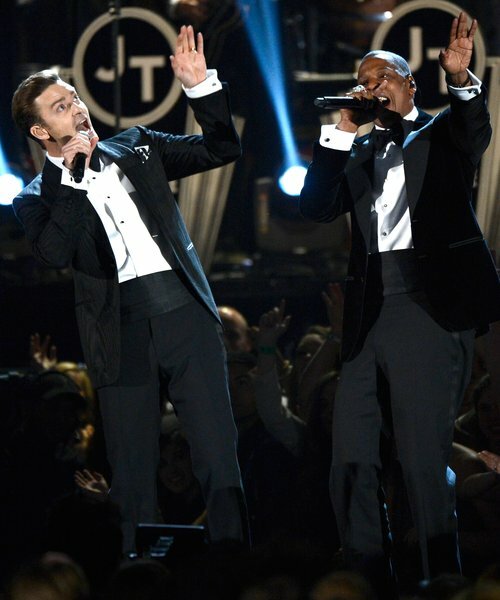 Justin Timberlake and Jay-Z have reportedly teased details of an apparent joint summer tour for 2013. Rumours of a stadium outing between the two stars have been rife for weeks with the rapper taking to his Life + Times blog to post a series of venues tagged with the note #LegendsOfSummer this week. If confirmed, the pair will play 12 dates across the US this summer including the famous New York Yankee Stadium and Fenway Park in Boston. No dates or further countries have been teased as of yet – with fans on Twitter anticipating an imminent announcement confirming the reports soon. It was also recently announced that the pair will co-headline this summer's Wireless Festival at the Olympic Park in London. Meanwhile, Justin performed his new song 'Mirrors' for the first time at the BRIT Awards 2013 this week as well as his own headline show at The Forum in Kentish Town.